Michalis Sioulas is a Special Teaching Staff member at the School of Architecture, Engineering and Environmental Sciences, as well as member of the Senate of the University (since 2014). He graduated in 2005 from the School of Architecture of the National Technical University of Athens. 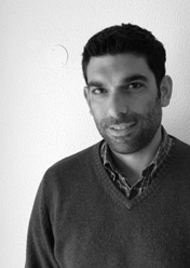 He holds a Master’s Degree in Conservation and Restoration of Historic Buildings and Sites (NTUA, 2009) and he is currently conducting a PhD at the same University in the field of architectural heritage. He has participated in research programs of the National Technical University of Athens, the University of Cyprus and the Neapolis University of Pafos and he is a member of the research team of the Mesarch Lab at the University of Cyprus (research laboratory focusing on the history and theory of modern architecture of the Eastern Mediterranean). He was Adjunct Lecturer at the University of Nicosia (2011-2013). He has practiced architecture in Greece and Cyprus conducting studies for private and public buildings. He has taken part in numerous architectural competitions, earning awards. He is member of ICOMOS, DOCOMOMO, TICCIH and EAHN.